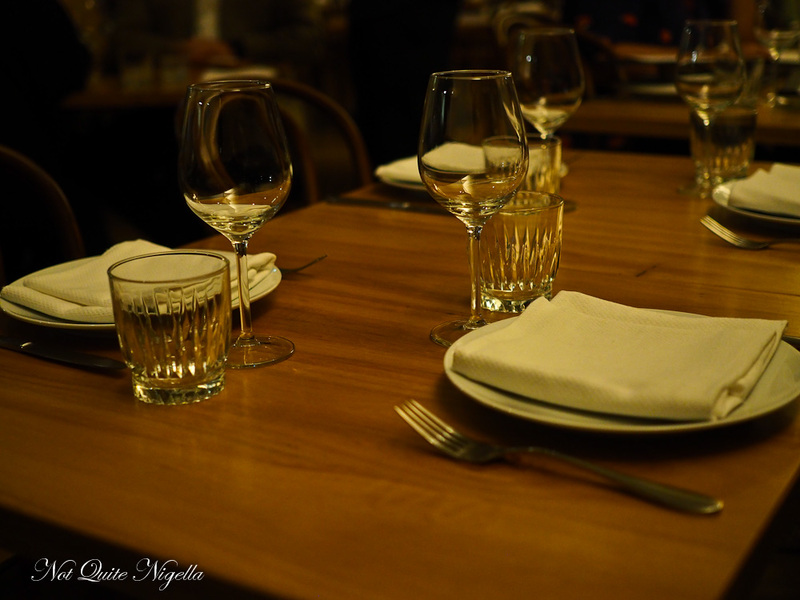 Bacco is a new Italian place with the chefs from Movida, Vini and Berta. 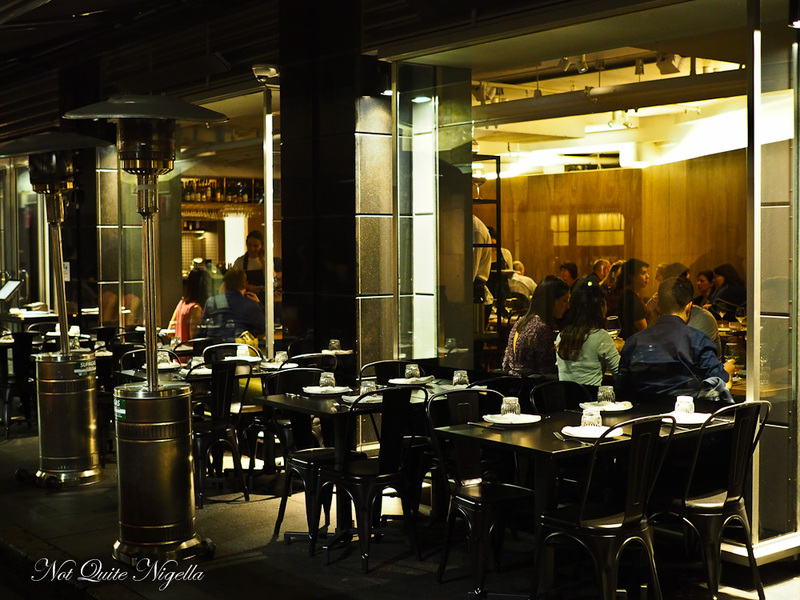 Being tucked away in Angel Place affords it a bit of quiet against the concrete jungle of the CBD. 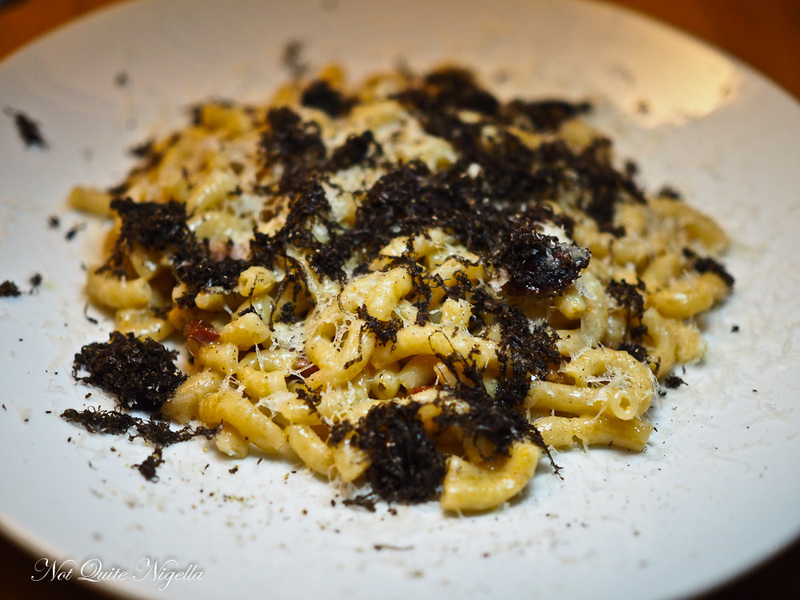 On the menu are divine house made salumis and pastas. "There are seven specials tonight," our waiter says solemnly before breaking into a smile. Then he recites them all one by one giving us detailed descriptions of every one. And unlike a lot of specials that we gloss over we earmark two for our meal tonight. Bacco is located opposite Mercado in Angel Place with enormous windows reflecting the concrete and glass of the area's restaurants. 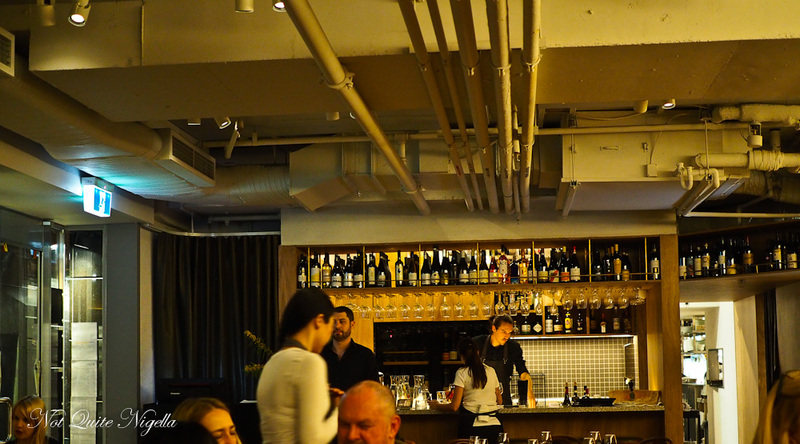 The restaurant is semi full on this Friday night and we are dining with Viggo and Louise. I've given up on being fashionable entirely. Due to the chilly weather I am wearing a chunky jumper, leggings and boots. This is a pasta eating sort of outfit, a version of stretchy pants. Our first dish is something that Louise spotted going to another table. 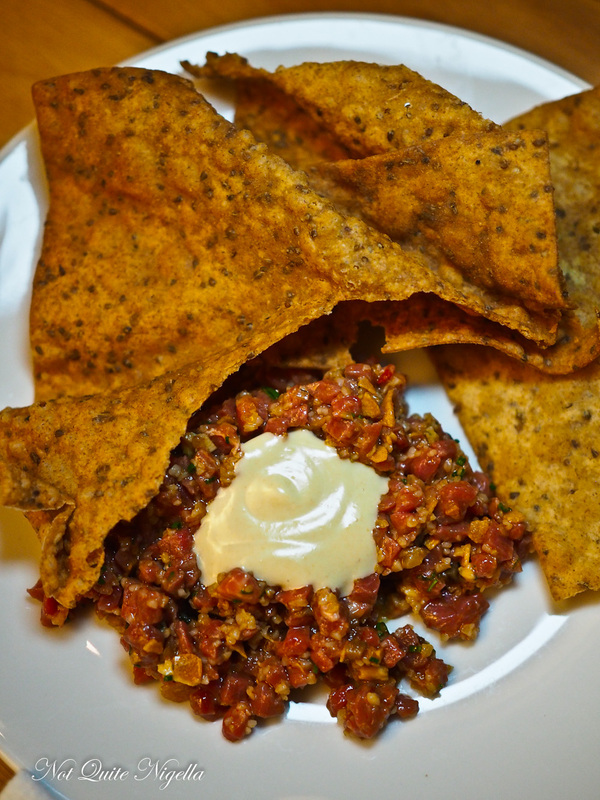 It's a lamb tartare with a rye crisp and an anchovy fennel sauce. We break a piece of the crunchy pasta fritta and spoon some of the finely chopped, creamy lamb on top. Heavenly. And I know what you're going to ask: does it taste "lamby" as in does it have a strong odour? Not at all. 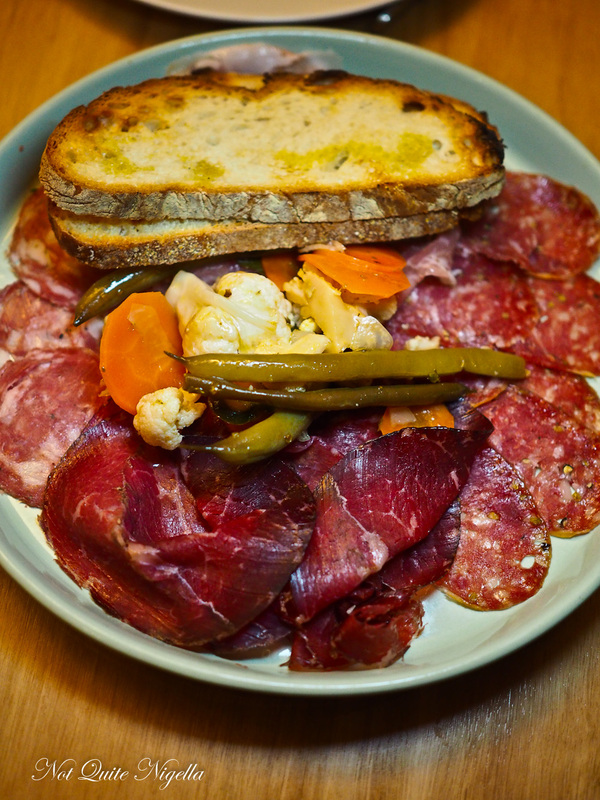 They make all their salumi in house and there's wild boar salami, bresaola, capacolla and ham on the plate. They're all wonderful with distinct flavours. I love the generous amount of garlic in these too. The giardinaria or vegetable pickles are strong and salty. How good is stracciatella, that creamy soft, fresh, cow's milk cheese? 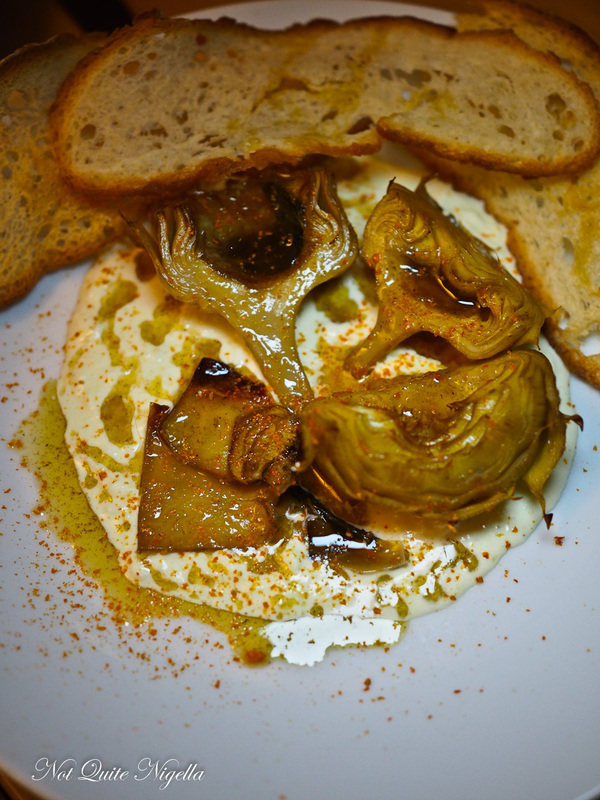 Here it is served with roasted globe artichokes with shaved bottarga. The stracciatella by itself is creamy and mild but the artichoke quarters are strong in flavour. 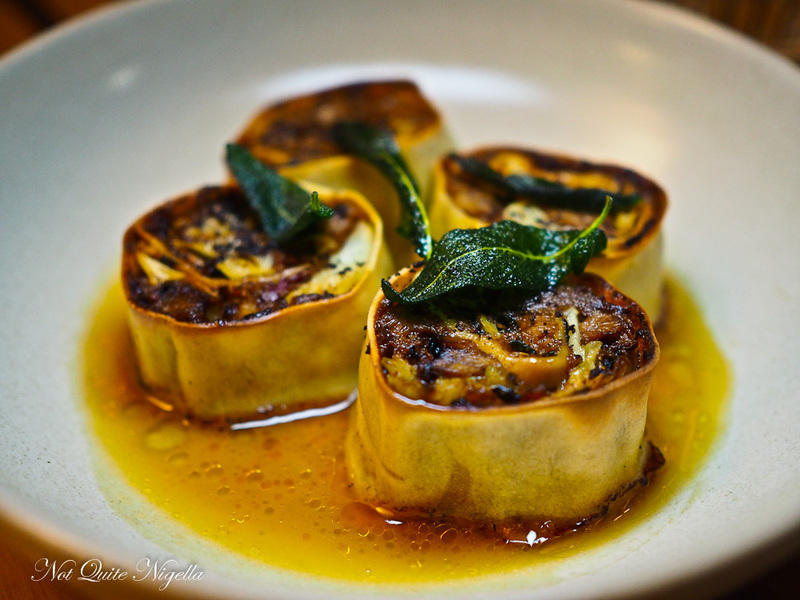 The rotolo pasta is a real table pleaser. It is also perfectly proportioned for sharing (not that we have any issues, we've been silly enough to split a burger into five portions). The pasta is filled with cabbage and soft beef brisket. The sauce is a browned butter and sage sauce that could be a bit nuttier-usually as soon as browned butter is set down I got crazy like a dog that has smelt its favourite snack. But really this is a wonderful pasta dish. They do this pasta in different shapes according to the day and this is served with guinciale or pig's jowl/cheek and truffle. I love guinciale and always tend to order anything with it. This is a nice wintery dish with a touch of creaminess in the sauce. 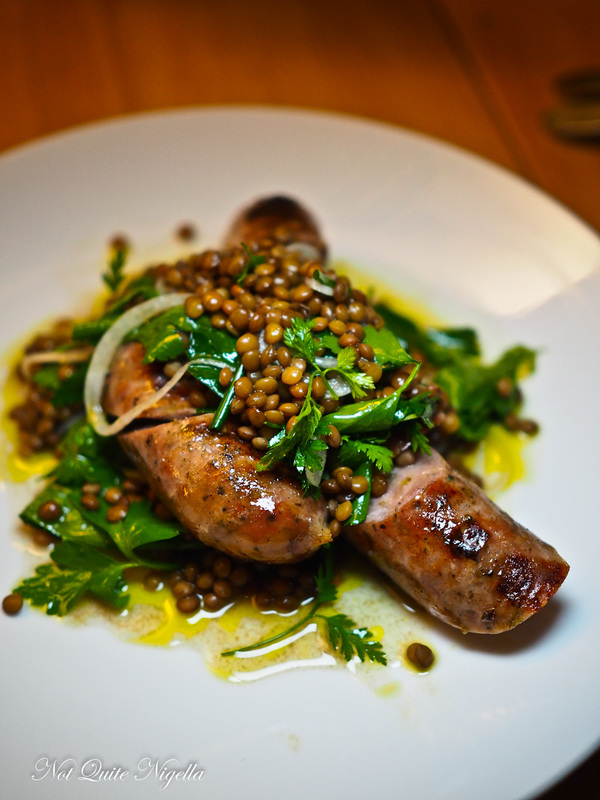 The Berkshire pork sausage is good and strong in fennel with a good porky flavour but I don't know if I would order it again. I've decided that I really need to upp my lentil eating game because while I love eating them I can never pick them up with a fork and knife. I think you really need a spoon for lentils. I wish I hadn't eaten so much at lunch today because I just wanted this whole bowl of potatoes. They're fairly crispy but what has my mouth watering is that they're rolled and served with nduja that soft, spicy Calabrian sausage spread as well as lemon and rosemary. 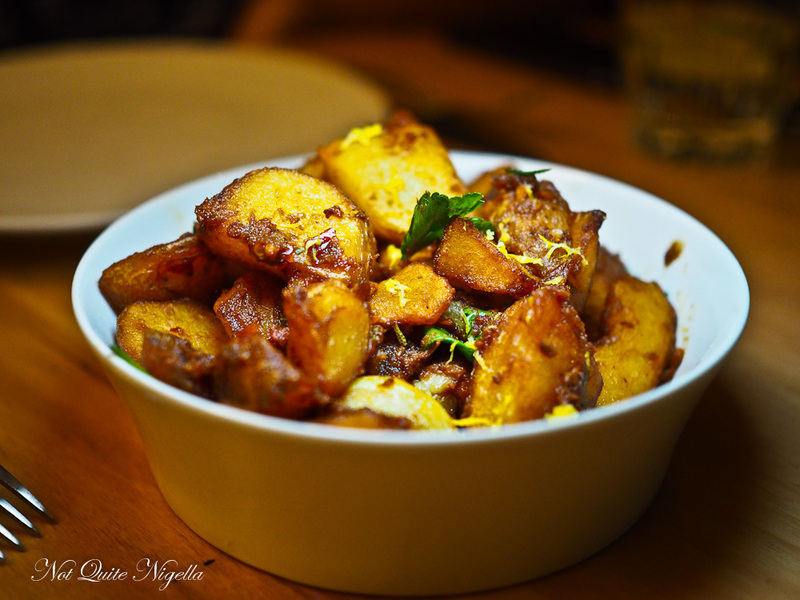 I'm even drooling now thinking about these potatoes. As much as we loved the entrees and mains we found that there wasn't a lot on the dessert menu that we really wanted to order. Viggo chooses the dessert. 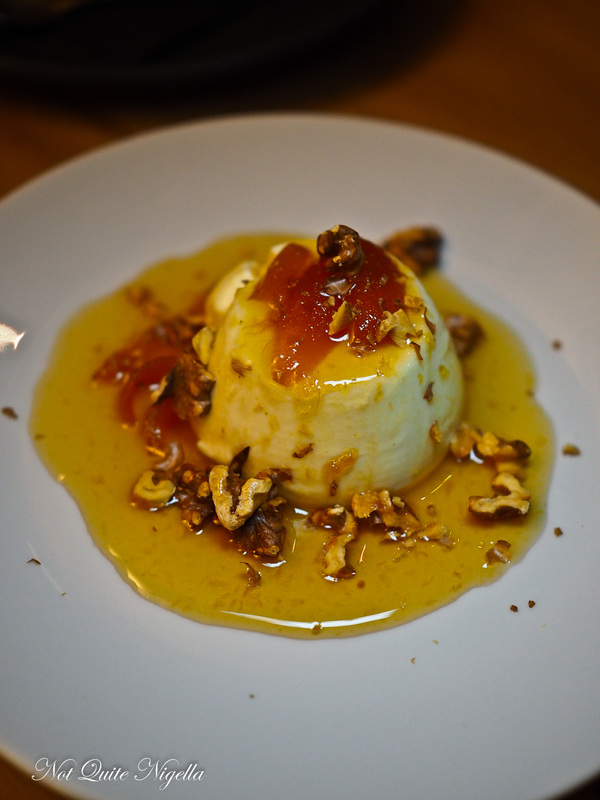 We don't often order panna cotta but the other things weren't jumping out at us. It's a nice enough panna cotta with a creamy, wobbly texture and the poached cumquats go well with it. I remember having an amazing sgroppino at Buzo so we order it again. Here instead of the lemon gelato being blended with the Prosecco and vodka it is a scoop of gelato sitting in vodka. We're not quite sure if we are to sip the vodka first and then have the gelato (probably) but it really is better served whipped as prosecco adds a lot to a sgroppino. The lemon and rosemary sorbet however is divine. So tell me Dear Reader, when you remember food or look at pictures of food do you ever start drooling? Do you ever wear "stretchy pants" out? And how often do you order specials?